Upgrade to Unreal Engine 4.20. Dedicated server application for community hosted servers which can be discovered in the in-game server browser. You can find our guide here. Alpha AK weapon for the Insurgent Advisor class and Security Advisor in Coop. Improved “zoom” scopes for the Low Scope Quality setting. New five objective Push scenarios for certain maps. New vaporization feature: characters will explode into blood if they take a high amount of explosive damage. Large scale changes to item loading. Items are now bundled and will transition between bundles based on usage, increasing performance and decreasing memory usage. Cosmetic caching is now used so that cosmetic logic only runs once, reducing hitching caused by player spawns and deaths. Optimized character movement, disable per-tick floor checks, allow prediction to be skipped on the same frame as net updates. Tuned garbage collection settings, adjusted permanent object settings, enabled actor and Blueprint clustering. Optimized CPU particles with asynchronous particle tick, parallel particle collision and PhysX optimizations. Reduced CPU cost of character animations. Remove expensive pre-simulations from various particle effects. Reduced CPU overhead of various audio effects. Disabled overlap events for simulated proxy characters. Props no longer gibify on dedicated server. Optimized multiple expensive merged actors. Reduced the number of LODs used on architecture, props and third person weapons to reduce memory usage. Reduced normal map and colour texture resolution scale on many props. Reduced particle texture sizes for anything above 4k. Reduced spawn rate on ribbon particles for cache explosion. Removed LODs from any prop under 500 triangles to reduce memory usage. Added map thumbnail images so Local Game no longer loads each map’s individual 4K loading screen. Moved explosion debris to GPU instead of CPU. Resave PlayerClass assets preventing unused assets from being loaded. Lowered the Weapon LOD settings from five LODs to four. Disabled physics on a dropped weapon if it is about to disappear. Adjusted LMUV resolution and LODs on all props. Halved the LMUV resolution of all foliage scatter props. Updated Fire Support particle bounding boxes. Blood sprinkle decals are now spawned less frequently to reduce decal spam. Merged all scatter prop textures into one atlas. 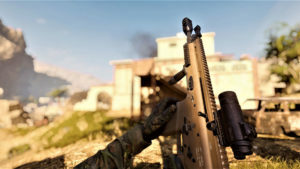 Increased recoil on the weapons throughout the whole game, with 7.62 caliber rifles and .45 pistols seeing a higher recoil increase than other weapon types. Recoil while crouching has been increased slightly (now has a 40% recoil reduction instead of 50%). Added extra recoil penalty for M249 and PKM to make them much less controllable when bipod is not deployed. When moving, heavier weight means less recoil than lighter weight, instead of the other way around. Max recoil when low stamina and low weight is now 140% instead of 130%, which will increase recoil slightly when tired. Increased shotgun recoil when in Aim Down Sights by about 20% (80% of default recoil instead of 60%). Reduced the aim punch drop after each shot on shotguns, making recoil feel a bit more emphasized and requiring more user control. Shotgun recoil aim punch will be additive now between shots instead of resetting after each shot. Disallowed Mosin Stripper Clip when also using the 2x Holographic, 2x Kobra and 2x Red Dot as the clip would not be able to physically fit in the weapon. Reduced sway speed when low stamina. Increased sway speed when at higher movement velocity. Reduced sway speed when suppressed. No stamina requirement to use..
No stamina drain from using, however stamina recovery is paused. Duration and cooldown are affected by stamina level. Increased 5.56 and 5.45 caliber bullet penetration. Machine guns and rocket launchers now have a longer Aim Down Sights time than normal weapons due to their heavier weight. Increased damage for .45 pistols to accompany the increased recoil. FAL and G3A3 now cost 4 supply. Reduced Browning HP supply cost to 1 supply. Default fire mode for Mk 14 EBR is now semi-auto. Updated ammo round weights and magazine weights. 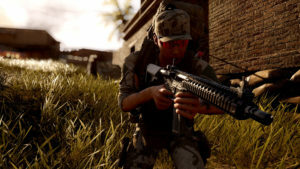 Launchers now have the same world FOV zoom as rifles when Aim Down Sights and using Focus for consistency, and also to make sure the RPG-7 is less penalized for not having a scope compared to the Security’s M3 MAAWS. Updated rocket launcher weights to be more consistent. Adjusted timing of melee impact. Allowed SMGs and LMGs to fire while meleeing if the finger is still on the trigger of the weapon. Deployed bipod is now restricted to realistic angles. Improved shotgun spread. The first pellet of a shotgun shell’s spread will now hit dead center with the rest in a cone of spread around it using a Halton sequence. Updated weapons barrel lengths to avoid them clipping through walls. Aim Down Sights time now scales to the player’s weight. Heavier weight means increased ADS time. Aim Down Sights time is now increased if coming out of sprinting. Reduced acceleration while turning and sprinting so that players can’t make sharp turns at full sprint speed. Taking damage will now force players to slow down momentarily. Falling from non-lethal heights will now temporarily slow down the player based on the height of the fall. Soft collisions are now enabled for teammates, with enemies still using hard collisions. Tweaked ragdoll head capsule to avoid faces clipping through the ground in first person. Projectile hits on body armor will now show a different particle effect. Removed ability to fire while sliding. Fixed some input issues with toggle sprint not always being reliable in some cases. Pressing reload while using toggle sprint will now stop the sprint in favor of reloading. Players receive a heavier suppression shader effect when taking damage. Added health post process effect which appears when the player is low on health. Adjusted suppression and stamina post process effects. Added fade from black at the start of the round when players are seated in insertion truck. Fixed an issue where you could vault inside geometry in some obscure cases. Charging restricts player from sprinting for 1.25 seconds. Charging at low stamina should feel a bit more sluggish. Charging into a character only damages them once. Slowed turn rate while charging. Fixed issue where charge could be stopped by letting go of the movement keys. Added underbarrel smoke launchers for Rifleman, Commander and Observer classes. Removed underbarrel smoke launchers from Demolitions class. Moved FAL from Insurgent Advisor to Insurgent Rifleman, Commander, Observer and Demolitions classes. Moved SKS from Insurgent Rifleman, Commander, Observer and Demolitions to Insurgent Advisor. Restricted the 5.56 suppressor for Insurgent Versus classes. Added 1x Holographic and 2x Holographic to appropriate Insurgent Coop weapons. Added missing Flash Hiders and Compensators for Insurgent Versus and Coop weapons. Replaced the FAL with the SKS for the Security Coop Advisor. Added Bipod to Security Rifleman Coop class. Added 2x PK-AS to all Security Coop classes. Added Suppressor for shotguns for Insurgent Breacher in Versus and Coop. Security Coop classes now have access to Insurgent weapon upgrades for available Insurgent weapons. Light Armor protection against explosions reduced slightly. Heavy Armor now protects more against damage from bullets with lower penetration values. Light Carrier gives 14 extra shotgun rounds instead of 19. Reduced recoil further when using bipods. Reduced foregrip vertical recoil reduction from 25% to 15%. Removed foregrip horizontal recoil penalty (was 10% increased horizontal recoil). Reduced foregrip sway radius reduction from 20% to 10%. Reduced foregrip sway speed increase from 20% to 15%. Reduced compensator horizontal recoil reduction from 40% to 30%. Reduced compensator sway speed increase from 20% to 15%. OKP-7 optic upgrade is now available for FAL, Mk 14 EBR, Mk 18 CQBR and MP7. Reduced the maximum amount of grenade launcher rounds from 4 to 3. Can no longer throw C-4 and IEDs while in a restricted area. Added a limit for the amount of C-4 that can be equipped. Smoke grenades will no longer stop movement when exploding. Set both the Molotov and Incendiary grenade flames to last 30 seconds. Push now has a maximum player limit of 28 players on official servers to provide a more tactical experience. Versus Firefight now has a six round limit and a four round win limit, with a team switch after three rounds. 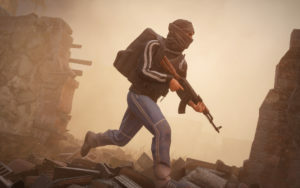 Checkpoint initial enemy spawns have been randomized and the radius extended, which will result in initial encounters much further from the objective. Renamed “IED Drone” to “Explosive Drone”. The Explosive Drone can now target windows and doorways, allowing the drone to fly inside and detonate within the building. When aiming an Explosive Drone at an applicable area, the particle indicator will snap to the window and change color. Explosive Drones can now be shot down. Added shrapnel feature to Explosive Drone explosion. Shrapnel will explode visible projectiles in a radius outside the normal explosion radius. These projectiles have travel time and can be dodged. Players will no longer take damage from fire support while inside the spawn zone. Increased speed at which artillery, mortar, and rocket rounds land on target. Fix artillery, mortar, and rocket rounds landing incorrectly on maps with larger vertical differences. Bomber Drones now drop impact IEDs instead of a combination of molotovs and grenades. Increase time it takes for helicopters to arrive. Allowed Minigun Support helicopter to perform counter-clockwise rotations around the attack target. Reworked Minigun Support helicopter flight pattern to enable weapons to remain on target and reduce its vulnerability when doing so. Increased speed of insertion truck in Checkpoint. Reduce friendly rocket damage against vehicles. Remove radio version of all Observer’s fire support requests. These are now only played in proximity of the player. Remove radio versions of thanking Station and fire support. These are now only played in proximity of the player. “Request Observer” radio lines are now only heard if you are an Observer. Added a delay to pre-round lines. “Low Ammo” lines are now only played for weapons with magazines. When capturing an enemy objective, ensure only players on the objective announce it. Added dialogue for helicopters when they begin attacking targets with their chain gun weapons. Fixed artillery and mortar completion lines never playing. Observers and Commanders can now have their Fire Support requests interrupted by being suppressed, flashbanged, or taking damage. If an Observer is requesting something and is interrupted, they will try to speak the request again. Molotovs and Incendiaries no longer immediately destroy doors. Door speed is now variable over time. A door will start to open slowly and then accelerate. Prevent exploit of certain console variables which were allowing users to hide all foliage and trees in an environment. Fixed view distance and foliage density settings to enforce consistent gameplay when it comes to the visibility of various foliage and tree objects. Fixed an exploit where players using rocket launchers could perform an ammo grab on a supply crate to get one rocket more than their Carrier allowed. Fixed a slide and jump momentum exploit. Added chatbox limit of 250 characters. Fixed VoIP not showing the name of the person speaking on the HUD. Individual players and teams can now be muted from the scoreboard by either clicking on the speaker icon next to a player’s name or selecting the Mute All button beneath either team. Fixed an issue where proximity VoIP was not heard. Please note there is a known issue with the attenuation over distance of proximity VoIP which will be improved in a future update. Uncommon cosmetics reduced from 300 to 200 credits. Rare cosmetics reduced from 600 to 400 credits. Very Rare cosmetics reduced from 1200 to 800 credits. Uncommon camouflage reduced from 500 to 300 credits. Rare camouflage reduced from 800 to 500 credits. Very rare camouflage reduced from 1500 to 1000 credits. Hovering over a cosmetic will now show a preview. New SMAA 1x post process anti-aliasing shader. The HUD color scheme can now be customized with custom colors. Presets include Default, Classic (Insurgency Source) and Day of Infamy. Added objective and teammate indicator opacity settings. Added option to hide objective briefing notifications. Added option to always show fire mode selection UI. Added option for FPS/frame time counter. “Wet Feet” is now obtainable. Added five new heads for the Security faction. Added new forearm tattoo appearance option and one selectable Security tattoo. More tattoos will be added for both factions. Added compensator, flash hider and extended magazine models which are now shown on the weapon when selected. New grunge bullet hole decal variations. New dirt mounds for the sides of structures. Added three new multi-colored painted wall materials. Added shader effect to shop signs and awnings allowing them to animate in response to wind. Updated the third person rifle sprint animation. New third person hit reaction animations. 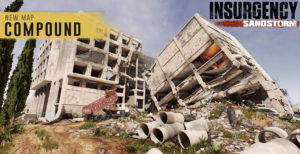 Updated the first person C-4 and IED cache rigging animations. New third person C-4 throw animations. New third person pre-round insertion animations. Driver’s head now rotates in third person when looking around. New third person knife slash animations. 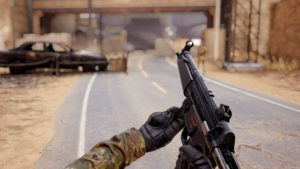 Improved third person animation when strafing with a deployed bipod, so the character’s feet move when panning left and right. Added third person underhand grenade primed throwing animation. Added third person prone grenade throw animation. Added third person ammo check animation. Added third person prone reload animations for the MP7. Added third person prone reload animations for the UZI. Added third person stand and crouch reloads for the M249. Updated Loadout menu third person animations. Added reload animation for the M16A2 to fix alignment with the 40mm mesh. Updated the M249 first person reloads. Updated third person launcher sprint animation. Updated weight shift when changing direction in third person. New third person pistol sprint animation. Added third person weapon down animations. Added third person draw and holster animations. Added new insertion truck pre-round animations. Improved first person melee charge animation. New first person “toss” animations for all launchers. Updated base reloads for M16A2, M16A4, Mk 18 CQBR, and M4A1. Added third person idle empty animation for weapons with bolt that locks back when empty. Prevent players from switching weapons while in the insertion truck to prevent certain animation issues. Improved Security weights for better deformation. Added specular masks for Security male hair. Improved material of Shades cosmetic. Improved textures on One Hole, Two Hole, and Three Hole cosmetics. Updated dirt layer on Insurgent pants and balaclavas. Fixed a bad material swap for first person gloves which was forcing them to use the third person material. Modified the sub-surface profile for heads to use the default scatter radius again. Reduced ragdoll impulse modifier for smaller caliber ammo types. Tweaked profile character rendering in the main menu. Updated materials on Flight cosmetic. 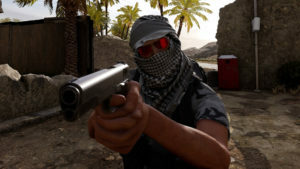 Improved first person meshes for Molotov, Mk 14 EBR, Uzi and L85A2. Added new side mounted laser sights for the Alpha AK, M16A4 and L85A2. Added new compensator for the M870. Updated scope reticle materials for 7x Hunting Scope and 4x PU Scope. Improved third person meshes for the M3 MAAWS, Kukri and Binoculars. Added third person drum magazine meshes for various AK and M16 style weapons. Added third person standard and extended magazine meshes for MP7 and Uzi. Updated the OKP-7 for the AKS-74U to use rail version with side mounted rail. Updated the third person AKM and AK-74 to use side mounted rails for optics. Updated the GP-25 textures and materials. Added pistol compensator muzzle flash. Added new scooter destructible prop vehicles that will explode when taking enough damage. Tweaked Hideout landscape and backdrop colors. Added color variations for painted metal wall materials. Edited light map UV resolution on scatter props. Updated environment modular industrial prop LODs. Added “Steam Friend Color” to HUD. Players on your friends list will be colored this both ingame and in the tactical map. Floating objectives will now show during the pre-game and pre-round. Implemented icons for drum, box and extended magazines as well as rockets and grenade launcher grenade rounds. Slightly increased overall size of display, including the sizes of the various magazine types. Box and drum mags are now noticeably larger than normal mags, with an increased magwell size as well. Improved the spacing between the magazine icons to be more consistent. Display now appears when you dry fire your weapon, indicating you’re out of ammo. Re-ordered fire modes with full auto at the top. Adjusted size and spacing of fire mode icons for a bit better readability. Removed “magwell” icon for weapon types that don’t warrant it like grenade launchers and rocket launchers. If the fire mode is not relevant to the weapon being used (e.g. launchers), the ammo display will shift to the right to remain aligned with the weapon selection UI. Shotguns now refer to rounds as “Shells” instead of rounds. Current Objective reminders now pop up after an objective is captured or destroyed in Push and Checkpoint. Improved accompanying text to be more specific to Push and Checkpoint objectives. Reduced misalignment of letters inside objective markers. Use Progress clamps to bottom of screen when it is offscreen. Active objective indicator at the top of the screen is now hidden if it’s the post-round and the Round Victory UI is up. Changed Player Target Font from SourceSans to Oswald. Updated icon for Bomber Drones. Added new supply crate interaction icons. Added indication animation of your location when the tactical map is first opened. Added new Commander and Observer player icons. Added vertical and horizontal recoil attributes for firearms in the loadout menu. Added new “Round Volume” metric for Ammo Types for determining Caliber size (by default it’s the round’s diameter squared multiplied by length, resulting in a millimeters cubed value). Updated only the weapon upgrade mesh instead of recreating whole model each time a new upgrade is selected. Added new icons for radios and laser sights. Added key hint support to loadout menu description for items that have an associated key to toggle them. Created new loadout menu animations for the IED and C-4. Some weapons icons are now right aligned for better presentation on the loadout screen. Improved texture quality/mipmap settings for all weapon icons in the loadout menu. If you are in the loadout menu when the match is over, it will now close, since your choice is no longer relevant. If you open the loadout menu when the round victory screen is up, make sure to hide the round victory screen so it doesn’t collide with the loadout menu. Fixed issue where when holding Tab (default key) while the scoreboard was active, it would jump around to the next widget, making it hard to actually click whatever you wanted to click. Fixed resolution scaling issue with scoreboard. Updated to include the faction emblems next to the taglines. Tagline collection now grabs each player’s top three taglines, allowing the UI to display multiple taglines for one player if their team does not populate enough taglines collectively. This should result in more “filled” taglines at the end of the round. Tagline screen now uses the proper color masked emblems. Added more taglines to the Round Victory screen including: “Finisher”, “Thorough”, “PTFO”, “Immortal”, “On Point”, “Wiley”, “Devious”, “But my K:D”, “Offensive Driving”, “Most Fire Support Requests”, “Sweet Tooth”, “Road Rage”, “Sneaky”, “Bryant”, “Chamberlain”, “Jordan”, “Tadaima!”, “Most Kills”, “Most Headshots”, “Most Objective Captures”, “Most Defensive Kills”, “Most Fire Support Kills”, “Most Offensive Kills”, “Destroyed Cache”. Updated Coop, Versus, and Competitive images and styling. Match Preferences can be accessed under “Play” at the top left and within the Coop, Versus, and Competitive buttons at the top. Added player level, competitive rank, and party functionality at the top right. Renamed Find Game to “Find Match”. Updated game type and game mode descriptions. Updated the Skirmish game mode overview image to contain vehicles. Updated the Push game mode overview image to show a weapon cache icon near the D objective marker. Moved number of online players to main menu as a total instead of showing per game type. Added 90 FPS option to the Frame Limiter advanced video setting. Added 256×256 option to the Shadow Resolution advanced video settings. When hovering over a combo box or a slider in the options menu, make sure those text values are darkened out (fixes weird white text on tan background issue). Cleaned up Off and On ordering of advanced video setting options for consistency. Made sure the Action Mappings and Axis Mappings aren’t cleared when resetting the controls to defaults. Character is now shown with gear. Disabled purchase and dimmed the cost element for items for which the player does not have enough credits. Renamed “Spec Ops (American)” voice to “Spec Ops”. Added outline on loading tips, to improve readability. Updated assets for cosmetic unlocking process in the post-match menu. Updated textures for unlocking credits. Reworked bot grenade throw behavior, to allow them to throw more accurately. Added new “throw grenade at windows” behavior, where bots will use any grenade they have and throw it at windows associated with the objective they are attacking. Expect molotovs and grenades through the windows during counter attacks. Reworked bot door behavior. They should utilize them much faster. Increased bot accuracy at close range by 25%. Bots should sprint more when capturing an objective or investigating. Bot will no longer fire RPGs at single enemy target, and now require a cluster of enemies. If a player begins capturing a point, and a bot is ambushing outside of the capture zone, they will abandon the ambush and converge on the capturers. Bots should prioritize capturing a point over investigating a target, unless they have arrived on the point. Bots will now spread out further from the objective when getting in position to ambush. Nearby gunshots/sprinting/voice noises will make the AI “aware” of the source as an enemy. This will allow them to breach rooms with players inside without requiring line of sight first. Previously they knew of a target inside, but weren’t aware it was an enemy, so would approach with curiosity instead of with aggression. Security bots no longer call in the Autocannon Strafe fire support option. Fixed a Checkpoint bug where bots were spawning two objectives away after finishing a counter-attack, causing there to be little initial resistance. Ensured bots don’t call fire support on solo targets, instead requiring a cluster of enemies. Prevented bots calling in fire support when the enemy is closeby. Fixed bots trying to request fire support that had zero remaining uses. Fixed inconsistent vehicle arrival times and instances of stray vehicles in Checkpoint counter-attacks. Fixed a bug where bots were ignoring fire while chasing targets. Fixed a bug where the final counter-attack in Checkpoint had less enemies than expected. Fixed an issue where bots could potentially get stuck in a leaning state. Fixed bots hearing sound created by their own teammates and responding to it as the sound of an enemy. Fixed a crash when you destroy a destructible objective with C-4 or an RPG-7. Fixed a rare bot fire support crash. Fixed scatter maps on all character heads for correct sub surface scattering. Re-enabled hair masks for Security males. Updated “Open Ambulance” collision mesh. Added a box collision for the bench part so players can’t clip through that anymore. Fixed “coffee pot” prop having the wrong physical material. Set rubble physical material type to gravel for better footstep audio. Fixed weapon bone location on the third person RPG-7. Fixed weighting on the third person L85A2 bolt. Fixed weighting on the third person SVD bolt. Fixed socket locations on the M16A4 for the rail covers. Updated the M4A1, M16A4, M16A2 and G36K loadout menu selection animations so that the 40mm round is exposed. Updated the smoke round texture from blue to white. Fixed the OKP-7 on the Mk 18 CQBR. Fixed for floating rounds on machine guns in loadout menu. Fixed ejection socket scale on the PKM. Fixed missing animations on the Insurgent Binoculars. Fixed some shell casing LOD zero settings set to zero triangles. Update LODs on planted explosive static meshes. Fixed alignment issues with the 2x PK-AS reticle. Fixed LODs on some of the GAU19 components. Fixed the FAL fire selector starting in the wrong position when switching from Automatic to Semi-Automatic. Fixed missing vaulting and kicking first person animations for grenades. Moved the laser socket to the right side rail on the Mk 17 Mod 0 to prevent it from obscuring low powered optics when attached. Fixed a material on the 2x Kobra optic. Fix muzzle socket location on the Security .45 suppressor. Adjusted the Suppressor socket on the first person Makarov. Fixed missing reticles on the SU230 and black 2x Holographic optics. Updated and fixed LODs on the drones and destroyed Gunship static meshes. Fixed Fire Support projectile LODs. Updated impact and explosion particle LODs. Fixed an issue where mounted weapon audio could become desynced from the vehicle’s position. Fixed screen flickering when walking through smoke grenade particles. Fixed inconsistent scope scaling across all scopes, rendering modes and aspect ratios. Fixed underhand grenade throws not being cookable. Press left click by default to cook, and right click to cook when readying a normal throw. Ensure ragdolls are not created if they have already been created after being killed in a vehicle, to prevent cases of floating T-posed characters after a vehicle is destroyed. Fixed issue where opening the comms menu would call in fire support if binoculars were equipped. Fixed issue where Gas Masks would not always show in third person. Fixed an issue where character meshes could become oversized while performing certain animations. Fixed an issue where the explosive charge on the suicide bomber would occasionally disappear. Fixed an issue with the seat camera in the transport truck. Fixed the drivers hands not always aligning properly on the steering wheel of vehicles. Fixed an issue where fire support projectiles were oriented at incorrect angles. Fixed an issue where the incendiary grenade would drop out of the air if it detonated before it landed on the ground. Fixed an issue where the player was forced to the escape menu on team switch. Fixed the Security Heavy Armor’s groin plate not acting as armor. Fixed explosive gas canister props being unable to kill you. The quick draw holster now only speeds up the draw of the holstered weapon and no longer influences the unequip speed or next and previous weapon cycle speed. Fixed an issue where you couldn’t join a passworded server. Fixed an issue where audio was not properly positioned when in the back of the insertion truck or when in the gunner position of a pickup. Fixed reliability of playing incoming artillery and mortar audio. Fixed a case where last one standing would trigger when someone was pending a spawn. Fixed DShK mounted weapon detaching from a vehicle and floating in the world. Fixed an issue where voice over which has both a radio and non-radio line would play two different random lines even though both should be identical. Fixed missing first person cache rigging animations. Fixed an issue with the main menu quit confirmation dialogue not receiving focus. Fixed an issue where lighting rigs were casting shadows at the wrong angle on walls. Take into account the screen percentage when scaling the scope render target. Fixed a bug where restricted area dialogue was being queued up in the insertion truck, messing with the dialogue queueing system. Fixed some bugs with the audio queuing system; speak delays were not being applied correctly and the oldest sound was not being prioritized. Prevent smoke based projectiles from causing shellshock to players. Queued dialogue is now cleared on round reset, which should fix delayed fire support messages playing in a new round. Fixed bug where equip/unequip modifiers from the quick draw holster weren’t being applied on the server. This was the causing the reload on switch bug. Fixed binocular audio Aim Down Sights entries. Fixed an issue where players who were not being rendered did not create footstep audio. Improved blending with idle specials. Fixed an issue where multiple sounds were created when charging into a door. Prevent mines from potentially getting stuck on wall geometry when thrown. Fixed an issue where sprint breathing and physical exertion voice over was not being passed to the aux busses. Fixed an issue where ragdolls weren’t spawning outside seats under certain conditions. Fixed an issue with auto-bipod where animation would play twice when drawing a weapon. Fixed an issue where it was possible to kick while leaning. Fixed bug that caused characters to never splatter blood onto surfaces while they were alive. Fixed an issue when dropping a weapon where the weapon would suddenly appear instead of dropping naturally from its current location. Fixed tesselation not working on some props. Fixed an issue where audio for rigging would continue playing if the player tapped the use key continuously on a cache. Fixed multiple instances of broken static meshes. Fixed an issue where melee audio and particle events would not properly time with the impact during the animation. Fixed fire support voice over interruption lines not playing correctly. Fixed an issue with the blood and burn macro function that caused blood and burn marks to be visible on undamaged surfaces. Fixed an issue where players could see more of the leg mesh than intended when performing a door breach. Fixed a bug that allowed players to vault on supply crates. Fixed an issue with bipods that allowed the camera to clip through walls when mounted. Fixed pears becoming oranges when shot. We are now eSports ready. Fixed some issues with player collisions on woodpile meshes. Fixed some issues with player collisions on the metal chairs. Fixed an issue where the weapon cache UI icon could disappear in Skirmish after being destroyed. Fixed an obscure issue where you sometimes couldn’t reload when you entered a vehicle. Fixed an issue where the detonator would not always be created for the player when rigging a cache. Fixed an issue with the Minigun Support helicopter dropping altitude rapidly when exiting the map. Fixed an issue where the fire support indicator HUD element would not always disappear if you change class from Commander to another class. Fixed a bug where grenade launchers would drop as separate weapons instead of remaining attached to the weapon they were equipped on. Raised the adaptive tessellation amount for the higher graphics settings to reduce vertex swimming issues. Fixed an issue where releasing the use key very quickly after throwing a grenade wouldn’t always trigger the rethrow. Fixed resuming drum magazine reloads as a part of the staged reload system. The correct animation will now be played. Fixed an issue with the melee flinch animation. Fixed an issue where Molotovs would break down doors. Fixed an issue where the M3 MAAWS would spawn an empty round casing on fire instead of on reload. Fixed an issue where when a spectator saw a character pick up a weapon, it would show the third person mesh instead of the first person mesh. Fixed an issue where broken vehicles or other physics props would collide with invisible walls. Fixed certain instances of fire in the world not causing pain to players walking through. Fixed an issue where players could vault past invisible walls. Fixed an issue where grenade throw timings were not being cached properly. Fixed an issue where dropped weapons would sometimes not show attachments or magazines. Fixed an issue where the greased bolt upgrade was not applying any effect when selected. Fixed an issue where chained grenade explosions would cause an incorrect number of explosions. Fixed an issue where certain weapons would be offset in the loadout selection menu. Reduced memory footprint by optimizing props and materials. Revised Push Security Scenario expanded to five objectives. Revised restricted zones across all scenarios. Replaced Skirmish truck objectives with caches. Improved playable area to make it more accurate to level borders. Added additional cover for Security on Push Security A objective. Various gameplay tweaks for Firefight scenarios. Tweaked global lighting to reduce brightness. Fixed able to see through rocks in certain locations. Fixed landscape and road bugs. Fixed various dynamic prop bugs. Added pain causing volumes on fire particles in reach of player. Revised Push Insurgents scenario expanded to five objectives. Minor level design tweaks to improve level flow. Fixed a playable area issue on Checkpoint Security. Fire particles will now cause minor damage to players in reach of them.